Our surgeons have the varicose vein education they need to help you to their best ability. They are some of the best varicose vein surgeons in Oak Lawn and Chicago. This procedure is offered to patients who have poor blood flow through the veins in their legs. When the valves in a patient’s legs don’t close properly, this is called venous reflux and it leads to swelling of the legs with enlarged veins that bulge. Often the swollen legs and/or veins cause pain and muscle weakness as well. This can be simply diagnosed by an ultrasound. In some cases, veins are not treatable with ablation or sclerosing so a surgical intervention is required. A deep vein (Greater Sphenous Vein) may need to be completely removed by a surgical procedure called vein stripping. This is a more invasive procedure where the patient is placed under general anesthesia and is asleep. An incision is made in the groin and another incision in the lower leg. The affected deep vein is separated from all the superficial veins that connect to it and is then removed. Sclerotherapy is a treatment for smaller varicose veins and spider veins. Varicose veins are veins that become enlarged and sometimes painful. They can even cause muscle fatigue, aching, tiredness, and itching of the affected leg. Spider veins are veins on the surface of the skin that appear as a network of red or purple lines. They are not swollen like varicose veins but can still cause some discomfort. Sclerotherapy is an injection of a special chemical (sclerosant) into varicose or spider veins causing the veins to close. Blood is then rerouted to healthier veins and the sclerosed vein tissue is eventually reabsorbed into surrounding tissue. There are other circumstances which also require a vascular surgeon. When a patient has a problem with blood clots, sometimes a filter needs to be placed into a large vein to prevent the blood from traveling to a different area in the body. Blood clots that reach the heart, brain, or lungs can cause life threatening conditions. An IVC, or inferior vena cava filter is a device that is implanted into the largest vein of the body. It traps blood clots and prevents them from causing further harm. Patients who have kidney failure require dialysis treatments several times a week. This is a treatment where blood is run through a filter and waste is removed. This is call hemodialysis. When patients will need long term hemodialysis, they need a permanent access site for this. Our surgeons can place an arteriovenous fistula or graft used for this purpose . This is when an artery or artificial graft is sewn onto a vein usually in the arm. Most often this procedure is done on an outpatient basis and patients can go home the same day. A phlebectomy is generally an outpatient procedure where small segments of superficial veins are removed through small incisions in the skin. Veins need to be removed when they swell, cause pain and /or the blood no longer flows properly through them. This is a surgical procedure where a blood clot is removed from a vein. These are blood clots that cannot be treated with medicine and cause severe pain, swelling and/or blockage of blood flow. Usually these can be performed on an outpatient basis. They can be done as an endoscopic, or inside the vein, procedure. 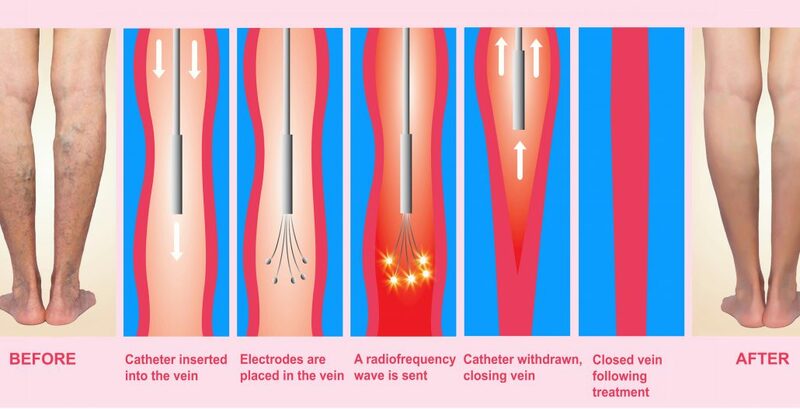 A catheter is inserted into the vein and then threaded to the location of the clot for removal. The clot can also be removed through a surgical procedure where an incision is made in the skin above the vein with the blood clot and then blood clot can is removed.